The first model of the beige trench coat was created specifically for the military, the soldiers of the first world. Both women and men should thank the founder of the fashion house Burberry for this versatile clothing. Classic trench coats, which the brand produces to this day, are made of thick, water-resistant gabardine, and have characteristic design features: double-breasted style, slightly fitted cut, slot for easy movement, a yoke on the back and chest that protects from the wind, shoulder straps , roomy pockets, belt with a buckle. 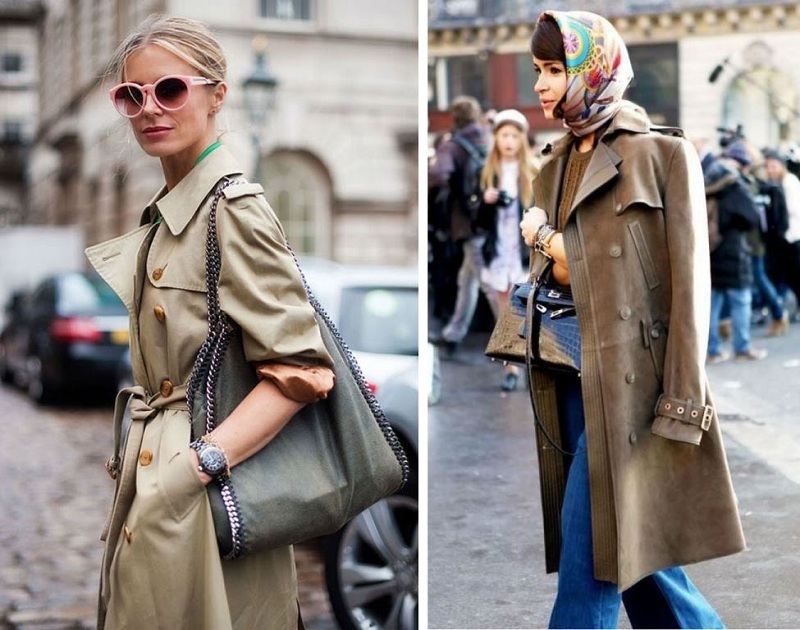 Beige women’s trench coats today are in the collections of many designer brands, which once again confirm the continued popularity and versatility of a classic double-breasted raincoat. The original prototype of the very trench and today can be found on sale. In Berber’s collections, for example, the famous cell on a beige background with a lining became its main difference. There are some deviations from the canonical style, which allow themselves many famous designers and brands of a mass-market category: elongated and shortened models, overcoats in an oversized style, trench coats. And yet, the classic, original model, as on a selection of photos, has so many advantages that you should definitely include it in the basic wardrobe of every woman of fashion. Beige women’s trench coat to the knee, just below or above is for everyone without exception. It can be worn with strict suits and sports trousers, cocktail dresses and miniskirts, put on for walks, parties and for work in the office. For cool spring and autumn weather a female trench coat from gabardine, tweed is ideal. In the summer, in warm sunny weather, a lightweight raincoat made of viscose, silk, polyester, and silk is needed. It should be combined with clothes from the same lightweight summer fabrics. 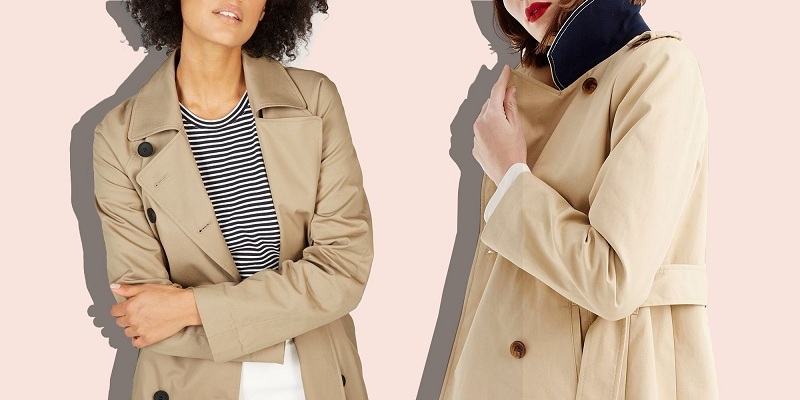 Stylists recommend wearing a trench coat in several ways: buttoned, with a knotted belt or unbuttoned, and just thrown over shoulders, with rolled up sleeves, with a raised and down collar. The latter option is particularly suited to the image with a pantsuit and a strict jacket. If the bow with the imposition of one turn-down collar on the other is not very successful, a contrasting scarf, scarf or stole will help. What and how to combine a beige trench coat? The only thing worth giving up is a bow with a full skirt-pack or dress of much greater length than the trench coat itself. A basic beige trench coat on a belt is perfect for creating an image of a business lady. It can be worn over a trouser suit, a jacket with a skirt of strict or classic style, a skirt with a blouse or shirt. Trench over a double-breasted jacket is better to wear buttoned or mask open collar with a scarf of noble colors, as in the photo below. Flared skirts and pleated skirts of medium length always look feminine; they can be combined with tops, T-shirts, blouses, bodysuits, sweatshirts and ankle boots. A shirt and a miniskirt with a beige trench coat in a tandem with boats, ballet shoes or stiletto shoes are suitable for a romantic walk or party, social event. How to wear a beige trench coat with pants and shorts? Pants in this image can be absolutely any style, but it is better to stay on fashionable chinos, culottes, shortened or slightly tapered models. Beige trousers and trench coat are combined with a plain shirt, a light blouse, turtleneck, and a crop top. The shirt can be worn over the trousers, complemented with a jumper, sweatshirt or tucked into the belt, emphasizing the waist. It is recommended to trim short shorts from knitwear, denim, costume fabric with modest blouses and shirts, sweaters in tandem with trench and ankle boots or slip-on, as in the photo. Skinny jeans, boyfriends who are close to classic and frayed, torn, “boiled” models fit perfectly into the image with a beige trench. 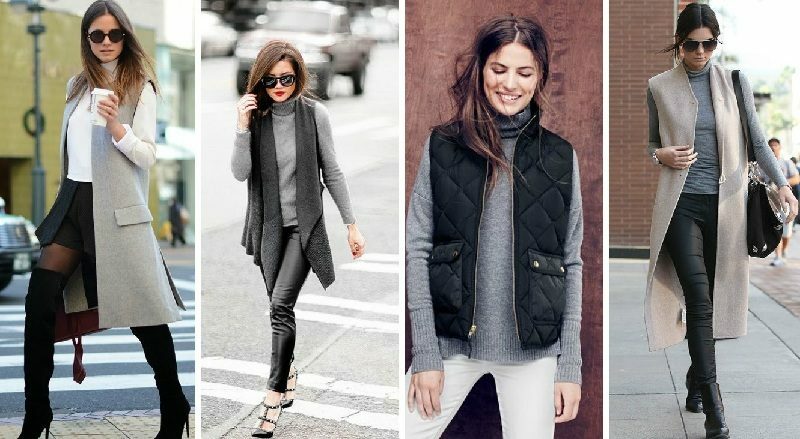 Also, tight leggings, including leather ones, look good in this tandem – with sweatshirts and blouses, with ankle boots, sneakers, sneakers, low and high-speed shoes. A classic tandem that will be appropriate for any occasion is a plain dress sheath, pumps, and a beige double-breasted trench coat. Since beige is a base color, it goes well with any prints and colors, fabrics and styles (and this applies not only to dresses). Classic women’s beige raincoat will look favorably and unbuttoned with thick and light chiffon fabrics, satin, silk, knitwear, knitted dresses and models of linen and cotton. Floral prints, cage, peas, abstraction, inscriptions, blue, red, emerald green and coral models of dresses of different styles in a pair with suitable shoes perfectly highlight the neutral beige raincoat. What shoes can you wear a beige trench coat? The choice of shoes to the image with a classic women’s trench depends solely on your preferences and the reason for which you choose the outfit. Depending on what you wear under a raincoat, pants, skirt, dress or denim overalls, you can choose sports or classic shoes of the original or austere design, high speed or flat sole. 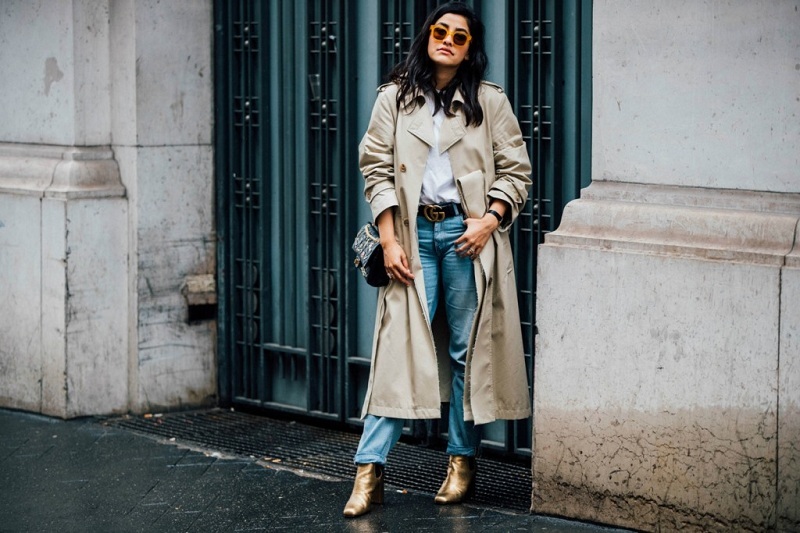 Trench coats are worn with sneakers, boots on a tractor sole, ballet shoes and high rubber boots, with gladiator sandals, pumps, and moccasins. Narrowed trousers, leggings and opening legs of dresses and skirts look equally good with any shoe, long and straight pants are best to wear with classic shoes, shoes, shoes, slippers, shoes in men’s style. For the classic beige raincoat for women, designers advise choosing calm and discreet, feminine and elegant accessories. They can be neckerchiefs of delicate and bright colors, stoles, scarves, thin leather gloves. A hat with a brim, a classic knitted or leather beret, a scarf with a floral print, as in the photo, will work as a headdress. Sunglasses, bags of different sizes and shapes (including business and shoppers, medium-sized ridicules, small shoulder bags) are in perfect harmony with the strict and even brutal cut of the trench. They combine red, wine, dark blue and sky blue, bottle green, black, white accessories with beige cloaks – the color, shape, and size of the bag depend only on the taste of her hostess and the place where she goes. Experimenting with images built on a beige trench can be infinite. If you are still undecided on the color and style of the raincoat, take a look at the classic knee-length models – this basic version will definitely decorate and help diversify your wardrobe.